Cherry City Kitties : What's with these orange cats??? What's with these orange cats??? What is it with these orange cats on the blogosphere? 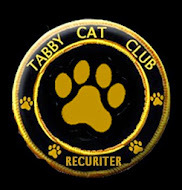 Do you think they have a secret sub-cult in the Tabby Cat Club??? The TOTs? Touch Orange Tabbies??? ppppbbbbllllttttt.... Look Willow... I can touch you! Back off you Giant Puma Kitten! No touching me or my spot! Shoo! Dad! Protect me from that wild thing!!! What do you think... it's the "back off orange cat" look, isn't it? LOL that is one back off look. Have a marvellous Monday. Yup, we have to agree, that is one great 'back off' look. Those darn Orange cats. We have four of them here and they are all a pain. So we know just how you feel. Hope all of you have a great week. Black cats are just as bad, as Lola has found out. Our Mum has never been owned by an Orange Cat - she doesn't know what she's missing!! Well, I live with an orange kitty and I do my best to annoy him and keep him in his place so his orange head doesn't get too big. Angel Tamir was an orange kitty. He was very special! Mommy says Ornj is a four-letter word! We think Miss Willow might have learned that look from Miss Ruby, Miss Katie and Miss Sparkle! Hmmm... while technically my coat is called "ruddy," it is actually quite a bit orange and I love "touching" things, though not usually my roommates. Maybe it is color specific or something. I had a wonderful female orange tabby years ago and I find orange cats usually pretty laid back. We had an Orange Menace mancat (now over the Bridge)who had extra toes for extra trouble. There wasn't a door or cabinet he couldn't open, and he didn't like them closed. I think what we REALLY need is a support group for cats with orange cats. Tuesday tail, nose and toes.